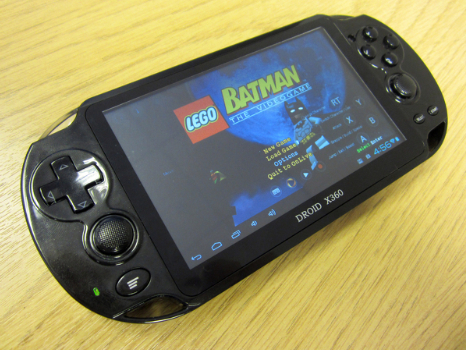 Can this Android-based Vita pretender teach Sony a few lessons? Digital Foundry finds out. The recent patent tussle between Apple and Samsung gives a fascinating insight into how intellectual property is safeguarded in the US. Companies are quite prepared to sink millions of dollars into litigation in an attempt to remain one step ahead of their rivals, and often the cases put forward appear nonsensical and flimsy to all but the most eagle-eyed patent lawyer, hence Samsung's bemused statement following the recent trial (which it lost) that Apple has essentially copyrighted 'rectangles and curved edges'. Contrast this situation with the burgeoning electronics market in China, and the notion of bickering over tiny details seems almost laughable. In the sweatshops of the Far East, anything goes, something that is proven emphatically by the Shenzhen XunLong Droid X360, a handheld console, which at first glance seems to have been manufactured purely to infringe the copyrights of as many companies as possible. Of course, the diminutive nature of these firms helps them to avoid the wrath of Sony, Motorola and Microsoft's lawyers, all of which have good reason to feel suitably aggrieved by the very existence of the Droid X360, and we can't even begin to imagine how difficult and impractical it must be to file legal proceedings against a company in China, irrespective of how many dollars you have in the bank. The irony is that despite the dodgy nature of the Droid X360, in some respects, it actually manages to trump the console on which it is based. 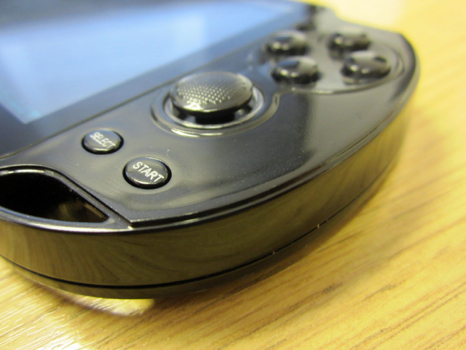 While it might lack the build quality and level of refinement displayed by the PlayStation Vita, it scores points in other key areas. You can use it to surf the web, send and receive emails, watch HD movies (both on the unit itself and on your TV using the bundled HDMI cable) and download thousands upon thousands of applications from the Google Play market. 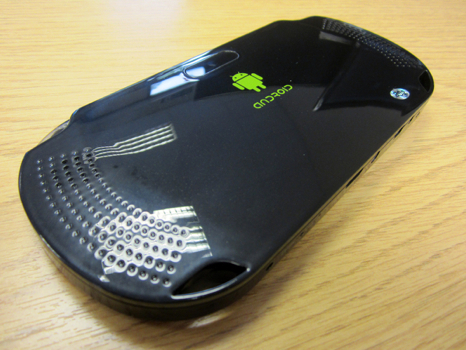 Droid X360 and PlayStation Vita: Separated at Birth? 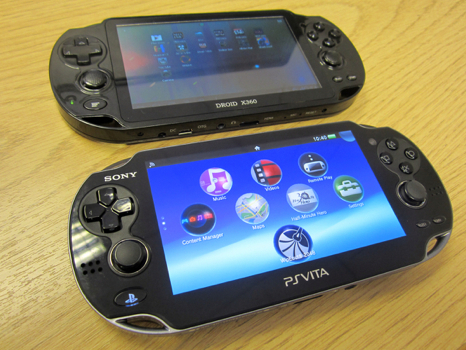 To the untrained eye, the Droid X360 and PlayStation Vita look practically identical. Everything from the positioning of the buttons to the transparent shoulder triggers has been faithfully replicated on the Chinese pretender; the key differences are a thinner body and the removal of the touch-sensitive pad on the rear of the device. In terms of weight, the two consoles are again quite similar. The glossy plastic on the X360 looks cheap and nasty, but the overall construction is surprisingly sturdy; there's no creakiness when you handle and grip the machine. Closer inspection reveals more disparities, however. The five-inch 800x480 pixel resolution screen (that's what it says on the box, anyway, benchmark tests suggest it's actually a bizarre 800x444) is generally bright and colorful, but suffers from viewing angle issues when you tilt the console away from yourself during play, the natural playing position of most gamers. It also goes without saying the screen cannot match the vibrancy and color depth of the Vita's striking AMOLED panel, and while it utilizes capacitive touch technology, it's nowhere near as responsive as the one on Sony's machine. While the arrangement of the controls is copied almost exactly from the Vita, the user experience afforded by them is vastly different. The d-pad and buttons have far too much travel on them, meaning that you really have to press down hard to register an input. This essentially makes precise control impossible, as quick presses are usually ignored by the system. At first, we assumed this was a software problem, but internal inspection reveals that the contact pads on the circuit board are too far away from the buttons. This issue alone is enough to completely scupper the Droid X360's chances of being a viable gaming device, but it gets worse. The twin sticks, which are digital and not analog, as many have naively assumed, are absolutely abysmal, requiring far too much force to use. They're so bad that they're rendered almost entirely redundant; it's virtually impossible to get any kind of decent control out of them. With the hardware side of things leaving a particularly unpleasant taste in the mouth, it falls to the software element of the X360 to wrestle back some respectability. It's running Android version 4.0 (4.0.4, to be precise), otherwise known as Ice Cream Sandwich. While this edition lacks the refinements introduced via Jelly Bean (4.1), it's still a fairly recent iteration, and offers up a series of enhancements over Gingerbread (2.3), which is currently the most common edition of the OS. It's also as close to being a 'stock' experience as you're likely to get on this kind of device; there's no obtrusive skin sitting atop the basic Android UI. However, using the vanilla version of Google's software doesn't appear to have imbued the X360 with the increased speed you might expect. Almost from the outset, we noticed a worrying amount of lag during basic navigation and when switching between applications. Even fairly simple tasks, such as opening the app drawer, are often accompanied by an unwelcome wait lasting a few seconds. In other cases, the unit steadfastly refuses to wake from sleep when the screen powers down, leaving you to assume that it has crashed or run out of battery. It's only when you return to the X360 a few minutes later in exasperated frustration that you realize that the unresponsiveness was simply down to system 'hanging'. There are other peculiarities to deal with, the most disconcerting of which is the X360's penchant for making random fart-like sounds, even when the screen is powered down and the unit isn't actually doing anything. The sound in question is also emitted when making touchscreen selections, and we're not joking with the description, it really does sound like someone is passing wind. This is embarrassing enough when you're actively using the machine, but having it happen when it's in your pocket on a crowded train is borderline mortifying. You can naturally drop the volume, but this means all other audio notifications are silenced. Despite the manufacturer's assurances that the X360 is packing a 1.5GHz processor, it's actually running an ARM-based single core 1GHz AllWinner A10 chipset, which includes a Mali 400 GPU. Both Quadrant Standard and AnTuTu Benchmark return unimpressive performance scores. This lack of grunt could be partly attributed to the low amount of RAM; although the Droid X360 is advertised as having 512MB of system memory, Quadrant Standard's system analyzer shows just over 300MB in use. One of the plus points of using the Android OS is access to the large number of applications on the Google Play market. Official apps are available for Twitter, Facebook, YouTube and a wide range of other services, meaning that the X360 comfortably trumps the Vita when it comes to app support. Even so, there are a few too many must-have downloads which are out of bonds due to incompatibly issues: Google's excellent Chrome browser and hipster photo-sharing tool Instagram being two of the more high-profile casualties. The story is even more depressing when it comes to Android games. The X360's dismal 3D performance means that modern titles such as Dead Trigger run so sluggishly they're practically unplayable, but there are a great many games that cannot be downloaded to the console at all, with the Google Play market gleefully informing you of the incomparability at the point of purchase. Unforgivably, some of the titles that can be installed only reveal their lack of compatibility when you've paid for them and attempted to load them up for the first time, Gameloft's physics-based puzzler Shark Dash being one such example. A faint glimmer of hope could have been offered up by OnLive, the troubled cloud-streaming gaming service that offers an Android-based app for gaming on the go. The X360 is perfectly capable of handling an OnLive stream, but sadly, the presence of physical controls is wasted. Unlike the Xperia Play, on which OnLive intelligently maps its controls to the respective buttons, the X360's quirky arrangement and relatively unknown nature means that nothing seems to work, aside from the d-pad. There's no way of configuring the controls within OnLive itself, resulting in yet another squandered opportunity to add to the X360's growing list of disappointments. Emulation: The X360's Saving Grace? Although we try our best to tread carefully around the potentially thorny issue of emulation when approaching Android devices, it's almost impossible to ignore with the X360. 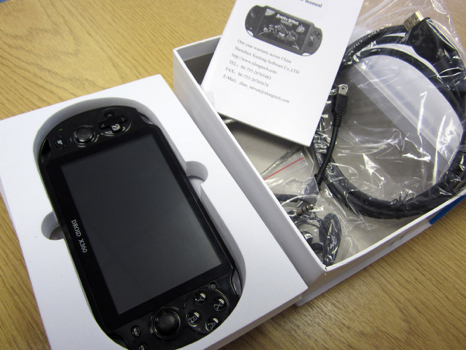 The unit comes preloaded with several emulators, all of which have supposedly been optimized to take full advantage of the device's physical controls. The term 'optimized' should be used lightly in this case; while the in-game controls have indeed been mapped to the X360's physical buttons, you're presented with some stunningly bizarre arrangements. For example, the Mega Drive emulator inexplicably maps the C button to one of the console's shoulder triggers. Overall emulation performance isn't bad, however, but many other systems do the same job so much better. 16-bit titles run at something approaching full speed, although frameskip is employed to keep things presentable. N64 and PlayStation emulation are both on the cards, but sadly neither is perfect; music skips, 3D rendering is often incorrect and overall speed is decidedly lacking. We also tested some other emulators that rank highly on the Google Play market, and despite a wider degree of customization options and compatibility, they offered similar levels of performance to the preloaded examples. While it's certainly impressive that a single, pocket-sized unit is capable of replicating so many classic consoles, it's worth remembering that Sony Ericsson's Xperia Play was performing this very same party trick over a year and a half ago, with markedly superior results, despite boasting a similar single core 1GHz processor. Battery stamina on Chinese consoles is famously inconsistent, despite the inclusion of high-capacity power cells. The X360 has a non-removable 2800mAh sealed inside its casing, which in theory should provide enough juice to keep you playing for several days. In reality, playing games, surfing the web and watching HD movies will result in a charging pattern of once every day or so. Left on standby for around five hours with Wi-Fi enabled, the battery level on our review unit dropped by around a quarter, which should give you some indication of the system's stamina. Had the unit been actively in use, that drop-off would have been even steeper. The Droid X360 could have been something of an eye-opener for Vita owners annoyed by the system's lack of software and direction. 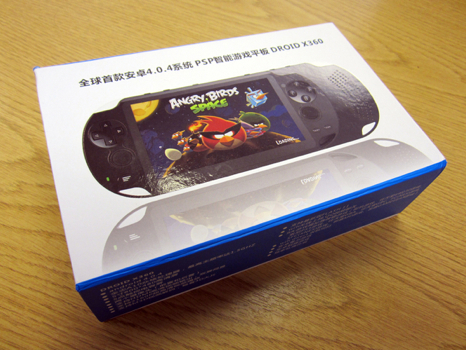 Looking past the wholesale theft of Sony's design, it's possible to detect elements, which elevate this Chinese copycat above the Vita, a machine, which costs almost three times as much. The use of Android potentially means a more open system, with the ability to install applications, transfer files and watch HD movies without having to jump through Sony's annoyingly restrictive hoops. Mirrored HDMI out, facilitated by a generously bundled lead, is another massive plus, allowing you to view your films on a proper television set, as well as turn your X360 into a true domestic console. Sadly, all of this promise is squandered thanks to some fatal errors in execution. The X360's physical controls are at best mildly frustrating and at worst totally unsuitable; it's almost impossible to enjoy games on this system because you can never put any faith into the responsiveness of the d-pad and buttons. The problematic interface is aided and abetted by some crippling OS performance problems, issues presumably caused by quirks in the hardware (low RAM being one possibility) or underlying software modifications made to Android 4.0 by the manufacturer. When you have a console, which regularly becomes entirely unresponsive for no good reason and makes inexplicable noises even when you're not touching it, any shred of enjoyment you might have otherwise experienced quickly evaporates. There could have been a valuable lesson for Sony here; if the company had conceived the Vita with Android in mind from the start, it could be offering players a unique 'bridge' device which not only plays the latest and greatest handheld games, but also doubles as a fully-fledged mini-tablet, something which would have allowed it to compete in the burgeoning mobile computing market and possibly even steal some share away from the iPad and Google Nexus 7. The X360 tries to offer a similar proposition, but too many problems exist for it to be a serious option. There's certainly a market for this kind of product, a fact that is proven by the recent announcement of the intriguing Archos GamePad, a dual core Android device with dedicated gaming controls retailing for a reasonable price, but ultimately, the X360 shares a common bond with the myriad devices currently being pumped out of China's less trustworthy factories: it's cheap, but fatally flawed. The sole reason people will have to recall its existence in years to come is its cheeky resemblance to Sony's handheld; outside of that, it's not worthy of anyone's attention. If your interest remains piqued regardless, you're really much better off investing in a cheap Xperia Play or waiting to see how the aforementioned GamePad pans out.